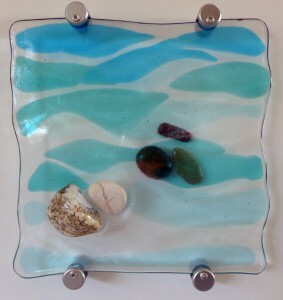 Mixing textured glass with polished pebbles and other material from Northumbrian and Irish beaches gives a particularly local beaches to these works. 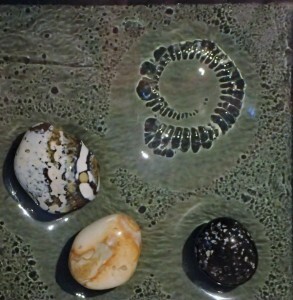 These pebbles are of flint from a beach on the north coast of Antrim in Northern Ireland. Glass is made using minerals like these, so there is a relationship between them. There is also the print of an ammonite from Dorset. 13 x13 cm. Framed (20 x 20 cm). 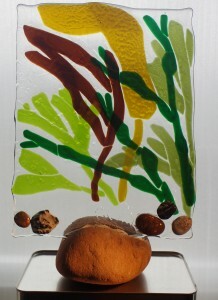 I have polished pebbles for many years, and wanted to incorporate them in my glass work. These pebbles were from the beach at Radcliffe, Northumberland. The two surface stones a made of flint. The ones beneath are a quartz and two pieces of local sedimentary rock. Glass is made using minerals like these, so there is a relationship between them. 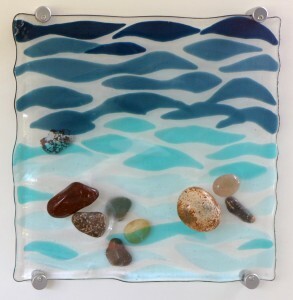 Glass is ideal to represent underwater scenes, and the use of waves in shades of blue makes the water seem deeper and more mobile while still showing the pebbles beneath. I have been an avid pebble-gatherer all my life. 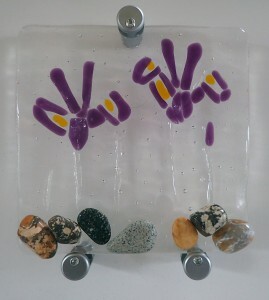 It therefore seems natural to include polished stones in my work. The pebbles here are from Northumberland beaches. Mounting them both above and below the glass gives more of a beach feel. The shades of blue reflect on the white board behind them, moving as you walk past, giving a deeper water effect. I have been an avid pebble-gatherer all my life. 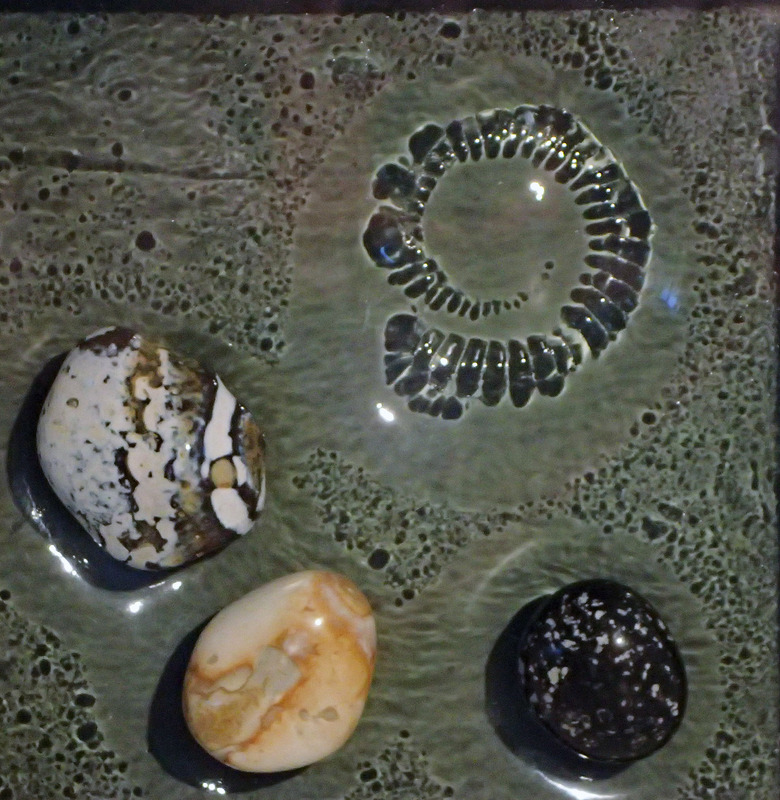 It therefore seems natural to include polished stones in my work. The pebbles here are from Northumberland beaches. Mounting them both above and below the glass gives more of a beach feel. The shades of blue reflect on the white board behind them, giving a deeper water effect. I noticed autumnal leaves floating gently on a local stream, over the pebbles beneath. The bubbles in the glass make it look more frozen, although there are ripples on the surface. 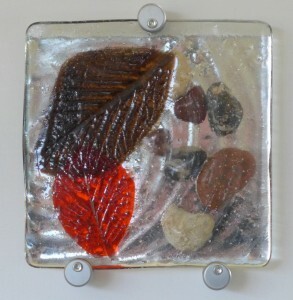 It is mounted over tinted mirror to shine more light through the leaves and show their veining. I love these miniature irises, especially in troughs with gravel. 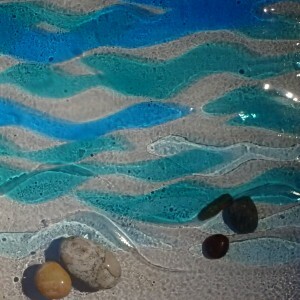 I have used polished pebbles from Antrim beaches to set them off.